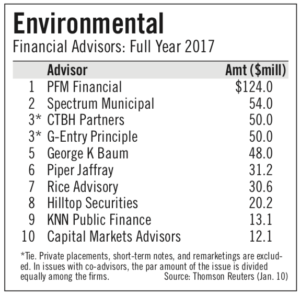 The Bond Buyer reported that CTBH Partners LLC ranked as the #3 (tied) financial advisory firm in the environmental sector in the nation for 2017, according to Thomson Reuters. During 2017, CTBH Partners served as the financial advisor to borrowers on $50 million in transactions in the environmental sector excluding private placements, short-term notes, and remarketings. So far in 2018, CTBH Partners has served as financial advisor on over $30 million in corporate tax-exempt debt offerings within the environmental sector. Since 1968, private companies and nonprofit organizations have been able to finance qualifying projects by issuing tax-exempt private activity bonds (PABs) as an alternative to traditional debt. The benefits of PABs include (i) potentially significant interest rate saving due to the tax-exempt status of the bonds, (ii) potentially longer term debt than otherwise available, (iii) access to the municipal bond investors as an additional pool of capital, and (iv) flexible financing structures. Currently, there are over $400 billion in outstanding tax-exempt PABs, excluding refunded bonds. Hospitals and other medical facilities are the largest sector of PABs, representing over $150 billion of outstanding tax-exempt bonds. In addition, educational facilities, including private universities and K-12 schools, have over $60 billion in outstanding tax-exempt PABs. 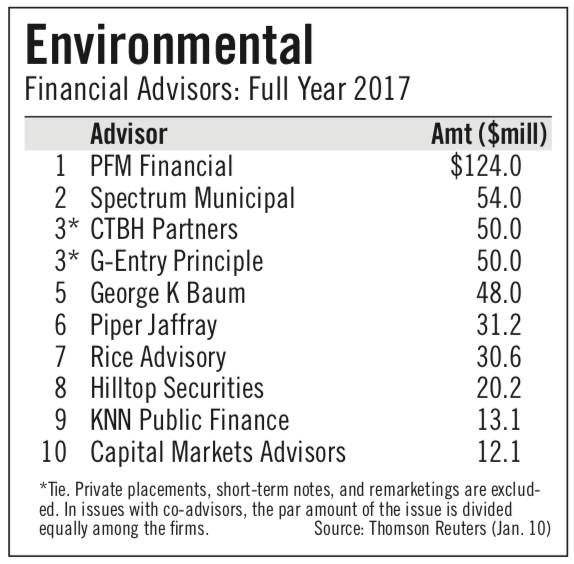 The environmental sector, while smaller, has over $5 billion in outstanding tax-exempt PABs that have been issued by both publicly-trade and privately-held companies. To learn more about how PABs are used in the solid waste industry, please see CTBH Partners’ whitepaper as originally published in the March/April 2017 issue of “Waste Today” magazine here. CTBH Partners is a registered municipal advisor with the SEC and MSRB. Since 2014, CTBH Partners has served as financial advisor to companies helping its clients raise over $130 million of corporate tax-exempt debt in six states. For more information on The Bond Buyer’s 2017 Annual Review, please click here. © 2017-2018 CTBH Partners LLC. All Rights Reserved.